There are many reasons you might want to have multiple Dropbox accounts running on the same computer: having separate work and personal Dropbox accounts, shared accounts with others, etc. 1Password app uses the work account to sync the keychain over Dropbox. This requires the Dropbox account to sync locally. This Dropbox help center article will tell you you'll need a business account (starts at $15/month) to do this smoothly (although also says it's possible but not ideal). Yes, a google search will point you to this lifehacker.com page which is the basis for the solution I will explain in this post. When I tried the solution posted on the lifehacker page, it worked well while my computer was turned on for that session but I started running into issues when I restarted my laptop. The problem is, the AirPort Time Capsule might have been spinned down and the contents of your Dropbox folder may not be available. 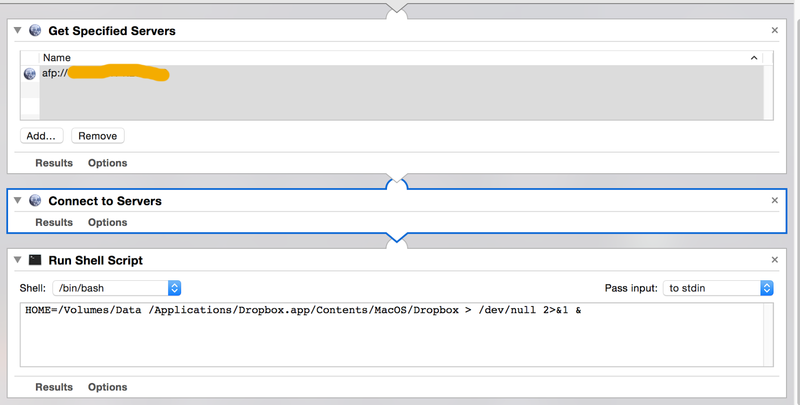 To work around this, I added two more steps before running the Dropbox launch script. This action is needed so a connection to the server is made in launch and the disk is ready to be accessed. You can add it the same way you added the previous action. Pick "Run Shell Script" action from the list of actions and add the script to run the second Dropbox instance from a different Dropbox folder. You can test the script by hitting the "Run" button. Name this automator script and save it to a convenient location on your Mac. Go to Users & Groups from System Preferences and add your automator script to the login items for your account. And you should be ready to go! The only caveat with this approach is when you're on a network that doesn't have access to your AirPort Time Capsule, you'll get an error message from Dropbox saying it cannot find the dropbox folder. Just hit quit and it will work next time you restart your Mac on the network that has access to your Time Capsule.